The Chilis menu for will surely make your mouth water. Find the Chilis Menu here and learn how to save money with printable Chilis coupons and coupon codes at America’s number 1 family restaurant. The Chili’s restaurant chain has conquered America due to their dedication to quality food and generous portions, but taste changes and Chili’s menu reflects that. For example, Chilis have recently introduced a ‘lighter choice’ menu, that appeals to weight conscious customers. The Lighter Choice items have no more than 750 calories, 25 grams fat and 8 grams saturated fat. Furthermore, the Chilis website now have downloadable pdf files with Allergen charts, Chilis Nutrition chart and a Vegetarian Menu to boot. The company offers a variety of coupons and promotions that will make your wallet smile. For more, please see our page ‘CHILIS COUPONS‘ on this website. Chili’s Grill and Bar is an extremely popular chain of casual dining family restaurants located mainly in America and Canada. The chain has over 1400 casual dining restaurant branches, but Chili’s first location did not open until 1975 in Dallas, Texas. Chili’s restaurants serve American food influenced by Tex-Mex cuisine. They also offer a veggie burger that is supplied by the Kellogg Company. Chili’s is owned and run by Brinker International. Please, note that the chili’s menu changes every year and some items may have been discontinued. Also, the official menu at www.chilis.com/menu does not include prices as these vary from location to location. Read about what the most popular menu items actually consist of. The appetizers are all made to order. Fried Cheese,Served with marinara sauce. Classic Nachos, with melted cheese, jalapenos, beans and queso . Crispy Onion String & Jalapeno Stack. Hot Spinach & Artichoke Dip. HAND-TOSSED in the Chili’s kitchen. Quesadilla Explosion Salad. Grilled chicken with cheese salad. House Salad With croutons, tomatoes, red onions, cucumbers and cheese. Bottomless Express Lunch. Pick any of the soups and a house salad with Unlimited refills. (GG) Chicken and Green Chile Soup. HAND-CRAFTED sandwiches served with hot homestyle fries. (NEW RECIPE) BBQ Pulled Pork. (NEW RECIPE) Santa Fe Chicken Wrap. Grilled Chicken, With applewood smoked bacon, swiss and honey-mustard dressing . Big Mouth Burgers are served with fresh lettuce, pickle, tomato and hot homestyle fries. Oldtimer Burger, with mustard and red onion. Add cheese. Classic Bacon Burger, topped with applewood smoked bacon, cheddar, red onion and mayo. Mushroom-Swiss Burger. With sauteed mushrooms, swiss and mayo. Try it with avocado slices for $.75. Shiner Bock® BBQ Burger. With sweet ‘n tangy shiner bock bbq sauce, cheddar and crispy onion strings. (NEW) Avocado Burger. With fresh avocado, red onion and swiss topped with avocado-ranch on a wheat bun. Big Mouth® Bites. Four mini burgers with layers of flavor – applewood smoked bacon, american cheese, sauteed onions, ranch dressing, crispy onion strings and jalapeno-ranch. Your choice of sesame seed or wheat bun. Black bean burger substituted upon request. TRIPLE-THICK BACON SMOKEHOUSE BURGERS with triple-thick bacon loaded on top. Jalapeno Smokehouse Burger. With applewood smoked bacon, smoked cheddar, tortilla strips, red onion, mayo, jalapenos and jalapeno-ranch dressing. Southern Smokehouse Burger. With maple bacon, smoked cheddar, mayo, crispy onion strings and ancho-chile bbq sauce. Original with Chili’s classic BBQ sauce. Shiner Bock® BBQ Sauce. Chili’s sweet ‘n tangy BBQ sauce made from Shiner Bock® Beer, brewed in Shiner, Texas, since 1909. Fajitas, served with warm tortillas, house-made pico de gallo, cheese and sour cream. Chicken or Beef Fajitas. With grilled onions and peppers. Buffalo Chicken Fajitas. Crispy chicken, spicy wing sauce, applewood smoked bacon and bleu cheese crumbles. Fajita Trio. Grilled steak, chicken and spicy garlic and lime grilled shrimp. Grilled Salmon with Garlic and Herbs. Monterey Chicken. Topped with bbq sauce, cheese, green onions and applewood smoked bacon. Served with mashed potatoes with black pepper gravy and seasonal veggies. Margarita Grilled Chicken. Classic margarita-flavored grilled chicken with hints of lime and citrus, served with rice, black beans, tortilla strips and house-made pico de gallo. Cajun Pasta. Penne pasta with creamy garlic alfredo sauce with cajun spices and topped with green onions. Add grilled chicken or shrimp. Classic Sirloin.100% USDA Choice 8 oz. sirloin topped with seasoned butter. Served with seasonal veggies and loaded mashed potatoes. Flame-Grilled Ribeye. 100% USDA Choice 12 oz. steak topped with seasoned butter. Served with seasonal veggies and loaded mashed potatoes. Chicken Crispers, Served with corn on the cob, homestyle fries and honey-mustard dressing. Crispy Chicken Crispers. Extra crispy chicken with corn on the cob, homestyle fries and your choice of black pepper gravy, BBQ sauce, honey-mustard or ranch dressing. Crispy Honey-Chipotle Chicken Crispers. Served with corn on the cob, homestyle fries and ranch . 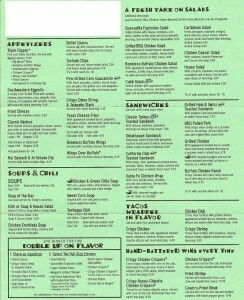 Chilis menu example. Note, this is an older menu and prices and menu items may have changed. Chilis are sometimes serving a dinner for 2 promotion, that gives you 1 appetizer and 2 entrees for just 20$. For the 2 for 20$ menu and the latest deals, discounts and promotions, please see our CHILIS COUPONS page.